Following Remy Sharp’s excellent You’re paying to speak post about conferences not paying speakers I thought it might be interesting to share some of my experiences. I’ve been on the road now for almost three years constantly presenting at conferences, running workshops, giving brownbags and the like. I am also part of the group in Mozilla that sifts through all the event requests we get (around 30-40 a month right now). I love speaking. I love the rush of writing a talk, organising my thoughts and trying to distill the few points I want the audience to take away to impress their peers with. I do it out of passion, not because I get paid. If I were to do it to get paid, I’d quit my job and ask for payment for my talks and run much more workshops. This is where real money comes in for speakers. As it is now, all I ask for is to be put up in a hotel, and – if possible – get my flights or travel expenses paid. I had a few events where the organisers flat out didn’t want to put me up in a hotel. I had a few events where I arrived in time for my talk just to see that the speaker before me was still speaking and my talk time was half of what I planned for. I even had an event where I had perfectly set up my computer (including already running screen recording) only to have a “sponsored pitch” speaker disconnect my laptop and give a five minute intro I wasn’t told about before my keynote. And here comes the kicker: every single one of these bad examples happened in the United States – most in San Francisco. The place where everybody dreams of speaking, the place where all the cool kids are and where apparently everything happens that rocks our web world. When I lost my credit card in Romania, the organisers of the Internet and Mobile World Romania came by the hotel, organised with the local restaurant that I could eat for free, got me some money to spend and took me out for an amazing evening to get my mind off the dilemma. That on top of a flawless pickup from the airport, great hotel to stay in and transport to and from the venue. Marc Thiele’s Beyond Tellerand conference in Germany is all about a cozy atmosphere encouraging speakers and attendees to mingle. He even had music artists sample the talks into songs live at the event. I am not saying I expect all of these things, I am saying that organisers outside the US seem to understand one thing others have forgotten and Remy mentioned as well: without good speakers putting effort in, there is no conference. That’s what a budget is for – which comes from ticket sales and sponsorship agreements. It is part of their budget because without a speaker, they have no content to sell. Of course there is more to a conference than just the presentations: there are booths, there is networking during breaks and at the afterparties. But you don’t need a conference for that – you could just attend a meetup. A conference is about good presentations and workshops. And this is where I get very angry when I see corners being cut when it comes to speakers. Yes, running a conference is expensive. And running one in San Francisco even more so. But why add cuts at the core content? Maybe spend less on the afterparty in a loud club with lots of drinks leading to socially inept people behaving like cavemen and creating the next “conference incident”. Maybe don’t move into the bigger location and instead allow your event to retain its soul? Conferences like dconstruct, Full Frontal and Edge Conf show that this works. As people who buy tickets, you deserve to get a good show. You deserve to be challenged, to learn something new. Of course, most of you do not pay for the tickets – your companies do – but that doesn’t make a difference. If organisers don’t value their speakers and instead pad their events with lots of tracks with just slightly veiled sales pitches you shouldn’t make jokes about this and have a coffee instead – you should ask for your money back. Nicholas Zakas also covered this in The Problem with Tech Conference talks lately. The hype we experience in our market also leads to a massive overload of events. Not all are needed – by a long shot. Some have been around so long they’ve become a spoof of themselves. It is time to ask for better quality. In the US, this is a tradition thing: tech conferences have been around for ages and there are a lot of terrible “this is how it always worked” shortcuts being taken. IT conferences have become cookie-cutter. Not only do you see the same booths, the same catering and the same companies, you also see the same kind of talks over and over again. As a company owner, I’d frankly not set up a budget for conference attendance any longer. It is not part of training when you don’t learn something new or get in-depth insight into something you already should know. And there is really no shortage of online content or even meetups where you can get the same information. The job of a speaker is to bring this content to life, to explain the why instead of the how or bring a new angle to the subject matter. This doesn’t happen if conference talks are limited to local speakers who are in the same echo chamber. Show us the money so you can talk? Which brings me to sponsoring. Mozilla’s and my policy is that we don’t sponsor events to get speaking slots. We want Mozillians to attend an event and have one speaker even before we consider sponsorship. Giving talks and giving money to the event are disconnected. I wished every company did that. There is far too much “pay to play” going on and that leads to boring sales pitches that are lucrative for organisers and insulting to the audience and, frankly, painful to watch. Having insight into the numbers around events is another thing that keeps amazing me. I can not tell them here, but let’s say sponsoring a coffee break in a San Francisco conference for 200 people easily pays for sponsoring a whole venue in Poland, India or Romania – including the posters and branding. So here’s my view: when I speak at your conference, I already sponsor it. I attach my name to it, I dedicate time to make it worth while for your audience to listen to me and you can add your branding to the video of my talk. 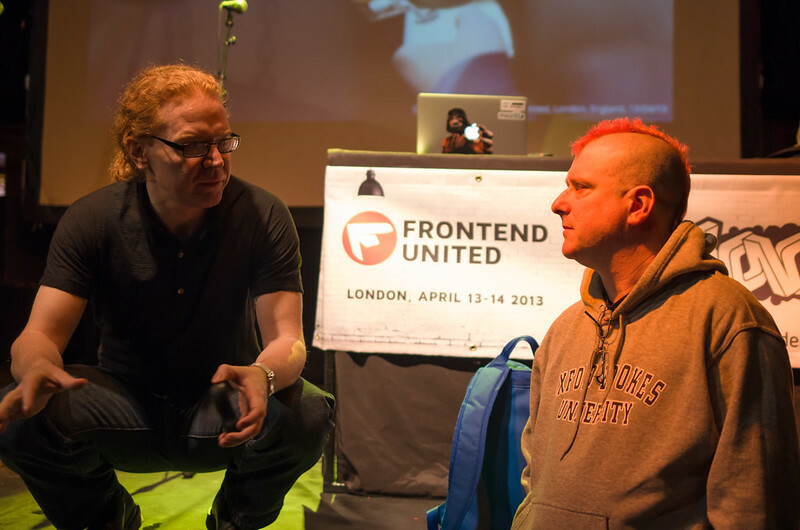 I will not pay to “get a better speaking slot” and I will not sponsor to “get another talk for Mozilla” in. I am happy to be at an event that values what I do. I will stop going to those that feel like I am just a name to attract people without really being challenged to give a good talk. As a speaker, I am a sponsor. Not with money, but with my reputation and my time and effort. That should get rewarded, much like any other sponsorship gets placement and mentioning. Comment on Google+ or Facebook or Twitter if you are so inclined. ← Audio Tags: Web Components + Web Audio = ?